Love the huge amount of healthy and essential fats and fiber! Forti-Flax really cleansing and nourishing; can be put into almost any recipe as well. Forti flax has a delicious crunchy texture and slightly nutty taste. Tastes great sprinkled on salads oatmeal great on lots of different dishes. Highy recommend. Oh the price here is excellent way cheaper than some other websites! I no longer do a workout without taking a couple of tablespoons of Forti-Flax with my cereal or oat bran first! Plus Pureformulas cant be beat for price and service. I wish all my online shopping was as easy and fair. I just sent my third order. Get your daily dose of omega-3 fatty acids‚ amino acids‚ lignans‚ fiber‚ vitamins and minerals with the all-in-one formula of Forti-Flax (Natural Nutrition) from Barlean’s Organic Oils. The flax seeds in this supplement are gently cold milled‚ organic and free of pesticides or herbicides. Flax seeds are rich in nutrients that help augment energy levels in the body and promote good health. These are rich in dietary fiber‚ manganese‚ vitamin B1‚ and alpha linolenic acid. Containing healthy fat and antioxidants‚ it helps curb free radical damage on healthy cells in your body. Thus‚ flax seeds may reduce the risk of malignant conditions and infections. 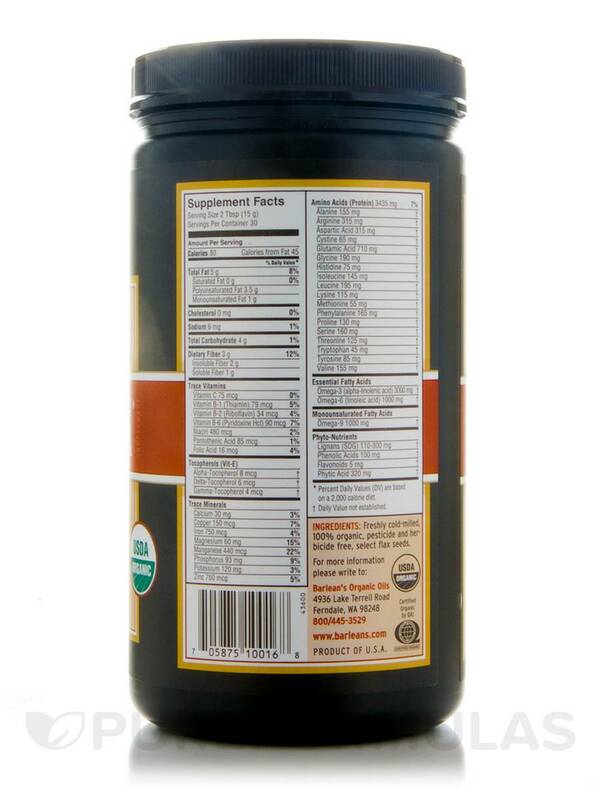 Flax seeds in this dietary supplement from Barlean’s Organic Oils help support a heart healthy lifestyle. What’s more‚ these fiber rich seeds may be particularly beneficial in supporting women’s health post menopause. It may also preserve the quality of life by regulating blood sugar levels. A rich source of Vitamin E and trace vitamins and minerals‚ it makes for a complete nutrition package. 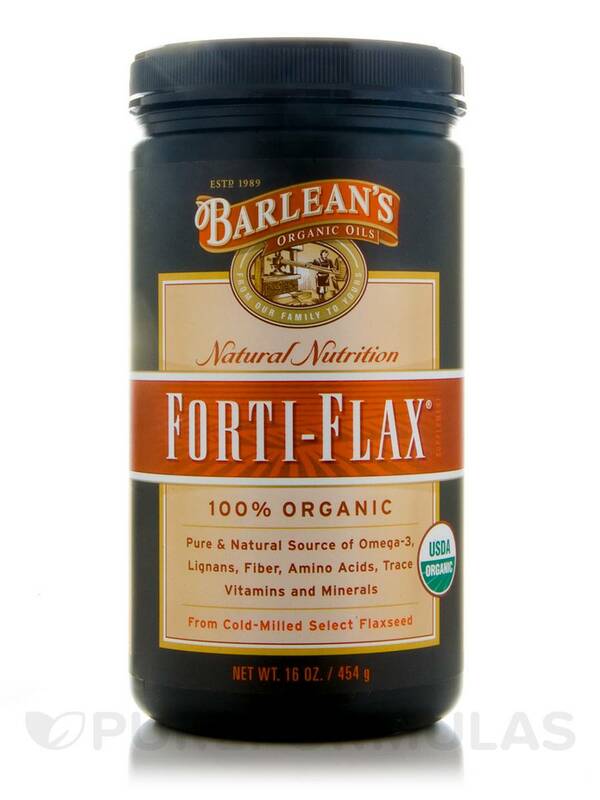 Forti-Flax (Natural Nutrition) from Barlean’s Organic Oils may indeed be your gateway to good health that lasts for a lifetime. 2-4 Tbsp daily. Mixes easily in water or juice. Excellent when used as a topping for yogurt‚ salads‚ breakfast cereals and used in blended smoothie beverages. May be used as a substitute for traditional yet nutrient-deplete fiber sources. I have used several of Barlean's organic products and have never been disappointed. The canister makes it easy to store the flax. Arrives fresh and fast. Best price on Internet. Its positive effect on my strength training. I love Forti-Flax. Flax is high in fiber lignans which bind to excess cholesterol and high in plant based omega 3 fatty acids Alpha lipoic acid. I use Forti-Flax in my fruit and veggie smoothies and shakes. Cleans me right out. I highly recommend to anyone trying to improve their health. I just purchased some of Forti-Flax (Natural Nutrition) by Barleans Organic Oils then went online to see if i could get a better deal than the organic store. Forti-Flax (Natural Nutrition) arrived in just couple of days and the milled and expiration date showed that it was fresher than from my local store. 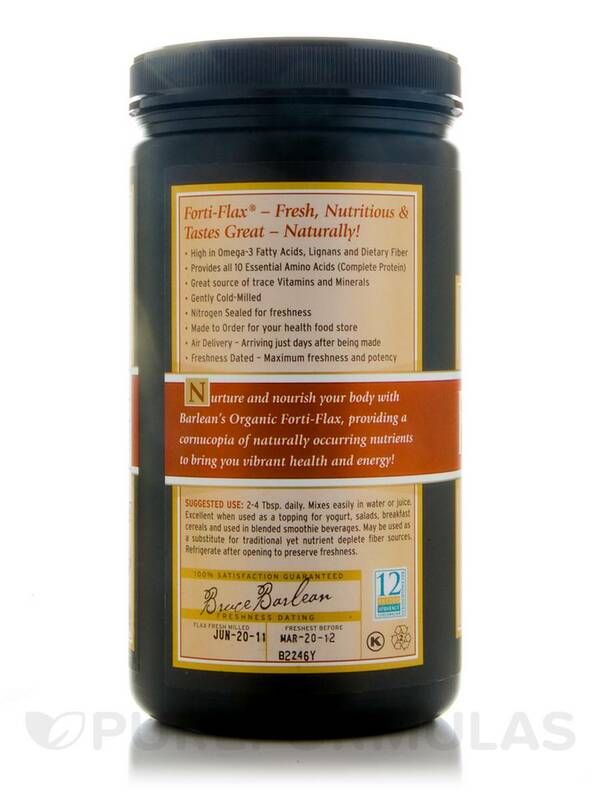 Great value and as long as the price is right i will now only purchase Forti-Flax (Natural Nutrition) from PureFormulas. Price, Freshness of product, Speed of delivery. Is this ground flax or the whole seed? Hi Neah, thank you for your question. This flaxseed product is grounded. Hope this helps. Have a happy and healthy day!